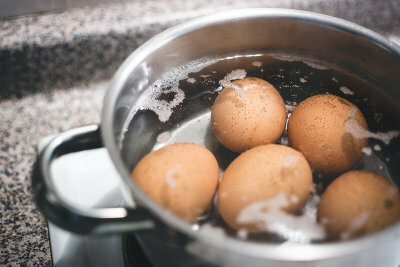 Here's how to hard boil eggs. Boiling is a naturally oil-free method of cooking "nature's perfect food." An egg contains a complete protein, healthy fats (enhanced if organic, due to the better feed given to organically raised hens), important B vitamins, and even the fat-soluble vitamins A and D that are uncommon in the American diet. Hard-boiled eggs will keep for two to three weeks in the refrigerator. They are ideal for healthy packed lunches. Place eggs into a large, deep saucepan. Cover the eggs with cold water, with extra room. Bring the water to a slow boil. The boil may be a very slow bubbling; but I have not found a hard, rolling boil to cause any problems with the eggs. Pour out the water from the saucepan. You may need oven mitts or pot holders. Run cold water into the saucepan over the eggs. This stops the cooking process. Remove the eggs with tongs to cool in a ceramic dish or similar container. After peeling, hard-boiled eggs can be easily sliced with an egg slicer. Dice the egg in the egg slicer by slicing it, turning it in the slicer, and slicing again. Diced hard-boiled eggs are a standard on salads.